Like the best-selling first two editions, A Handbook of Statistical Analyses using R, Third Edition provides an up-to-date guide to data analysis using the R system for statistical computing. The book explains how to conduct a range of statistical analyses, from simple inference to recursive partitioning to cluster analysis. Whether you’re a data analyst, scientist, or student, this handbook shows you how to easily use R to effectively evaluate your data. With numerous real-world examples, it emphasizes the practical application and interpretation of results. "… a handy primer for using R to perform standard statistical data analysis. … students, analysts, professors, and scientists: if you are looking to add R to your toolkit for analyzing data statistically, then this book will get you there." "I find the book by Everitt and Hothorn quite pleasant and bound to fit its purpose. The layout and presentation [are] nice. 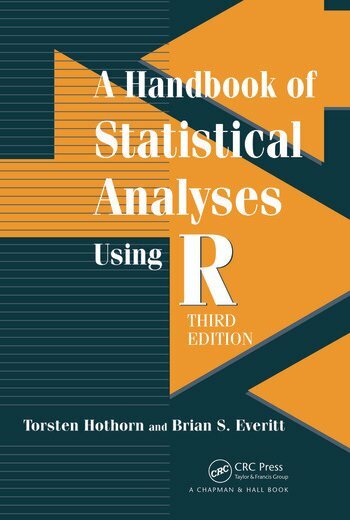 It should appeal to all readers as it contains a wealth of information about the use of R for statistical analysis. Included seasoned R users: When reading the first chapters, I found myself scribbling small lightbulbs in the margin to point out features of R I was not aware of. In addition, the book is quite handy for a crash introduction to statistics for (well-enough motivated) nonstatisticians." "… an extensive selection of real data analyzed with [R] … Viewed as a collection of worked examples, this book has much to recommend it. Each chapter addresses a specific technique. … the examples provide a wide variety of partial analyses and the datasets cover a diversity of fields of study. … This handbook is unusually free of the sort of errors spell checkers do not find."